Albion boss Chris Hughton says his players will be up for the challenge of trying to pick up enough points to stay in the Premier League. Although the Seagulls are seven points clear of the relegation zone, they have a tough final six matches beginning with Saturday’s trip to rivals Crystal Palace. 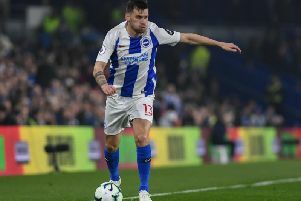 Brighton drew 0-0 with the Eagles at the Amex in the league in November, before they won 2-1 in the FA Cup third round in January. Hughton admits there’s pressure goinng into the game but said: “The players will be up for it. I don’t think there will be anybody that won’t want to play in that game. “It’s a pressurised game because of the rivalry but it’s another opportunity to get more points. Hughton acknowledges Albion have a tough finish after they only drew 1-1 with Huddersfield on Saturday. After collecting just one point from three league matches, he said: “As regards lifting the players, they will know the next game if anything becomes an even bigger game. Is Wolves v Brighton on TV, what's the team news, what are the odds?